Navigating the world of investing is incredibly difficult. It can be dangerous and confusing. Bad information and deceptive practices are everywhere. The only way to get through it is with the advice of a trusted advisor. A good financial advisor will earn her fees a million times over, but a bad one can charge you for the privilege of squandering your money. How can you tell the difference? These five factors can help you sort out the good from the bad in terms of financial advice. It’s always tempting to rely on advertising to identify providers of potential services. This approach tends to land you the service providers who have the most to spend, who usually turn out to be the biggest. Sometimes, that’s OK. When you’re choosing a financial advisor, though, that’s not the best approach. Big-time financial advisors are trying to get as many clients as possible, usually because they have a one-size-fits-all approach to investing. They may offer a limited range of strategies to meet most retirement needs. This approach can create two problems. First, there are unique aspects to everyone’s financial situation. If you have a separate pension, you might be able to pursue a more aggressive investment strategy. If you have a special needs child who will require significant care, you might need to be more conservative. These are not aspects of your life a big financial advisor firm is likely to consider carefully. Second, your financial situation may change dramatically. A sudden windfall or an unexpected pregnancy can necessitate a change in strategy. In those instances, you don’t want to be fighting for attention with a hundred other clients. You want a financial advisor who can spend time with you, assessing your individual needs and making recommendations tailored to your life. You can only find that at a small-to-mid sized institution. There’s a veritable alphabet soup of qualified financial experts. Between CPAs, ChFCs and CFPs, there’s a world of difference in licensing and experience required. Which one you should look for depends on what you need. If you’re looking for someone to advise every aspect of your financial life, you should look for a Certified Financial Planner (CFP). This certification requires years of training and a board-standardized exam on the ins and outs of the financial world. The slightly easier to obtain Chartered Financial Consultant (ChFC) license uses the same curriculum, but does not require an exam. If you’re just looking for investment help, you should look for a Registered Investment Advisor (RIA). Because these professionals provide financial advice and charge fees for it, they are held to the highest ethical standards. These are the experts of choice for most people who need retirement assistance. If it’s tax help you need, a Certified Public Accountant (CPA) is the person to consult. They can help you minimize your tax exposure. Unless you have a very high income or a small business, hiring a CPA may be overkill. Years of thrifty living may have turned you off the word “fee.” In most contexts, it’s a dirty word, a sign that you’re going to be charged money for something. In the context of a financial planner, though, “fee” is an important word. There are three kinds of financial planner payment structures. There are no-fee advisors who get paid a commission for each transaction they complete on your behalf. There are fee-based advisors who charge a fee but also get paid through other means. Then there are fee-only advisors who are exclusively paid from the fees they charge to clients. While a fee-only advisor sounds expensive, it may be your best option. Other fee structures many involve a bonus paid to the advisor for selling particular kinds of products. They may have a financial incentive to recommend services that are not in your best interest. This can put your needs behind those of the advisor, which is never a position you want with someone managing your money. 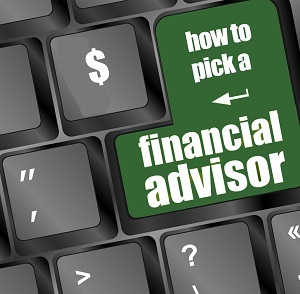 In an initial meeting, a good financial advisor will do much more asking than telling. They’ll want to know everything about your situation. Do you have debt? Have you started saving? When do you want to retire? These questions help to shape a retirement strategy around your needs. If they instead start talking about products first, watch out. That could be a sign of an advisor who is more interested in selling high-commission products than in serving your financial needs. If they’re trying to sell you something besides their own advice, it’s probably a bum deal. ake their advice, but they don’t really want you to intervene too heavily in these decisions. Other advisors will want to present you with a range of options and involve you in a collaborative process about your financial future. You’ll retain ultimate authority over decision-making. This kind of advisor can be preferable if you’re interested in actively managing some or all of your investments. Which style of advisor you prefer is largely a matter of personal preference. To get an idea of what style a potential advisor is using, don’t be afraid to ask for references. Talk to current customers about what they like and don’t like about the advice they’re getting. This is a great way to get a feel for the kind of advice you’re going to get.